Here is the Halloween themed variation on my DIY Toothpick Engraved Chocolate Bar Chalkboards. So far, I have used my original DIY toothpick engraving technique on chocolate bars for Father's Day, graduation, Thanksgiving, and Christmas, so I just couldn't resist adding Halloween to the mix! You can engrave a custom message into your candy bar, or create a spooky scene, it is completely customizable! Adorn your creation with all kinds of candy and you'll be handing out the absolute best Halloween candy to your friends, family, classmates or co-workers this year! Or the XL 4.4oz chocolate bars (that you can break up to create multiple smaller bars or keep whole for one giant plaque like I did!). For the inscription color you can use plain powdered sugar for a white engraving (like in my Edible Chalkboards), or tint the powdered sugar, like I did, for a festive touch with some gel food coloring/icing color of your choice. To tint powdered sugar, simply add a tiny bit of food coloring to a small bowl of powdered sugar with a toothpick (a little goes a long way, you probably will only need about 1-2 tablespoons of powdered sugar). 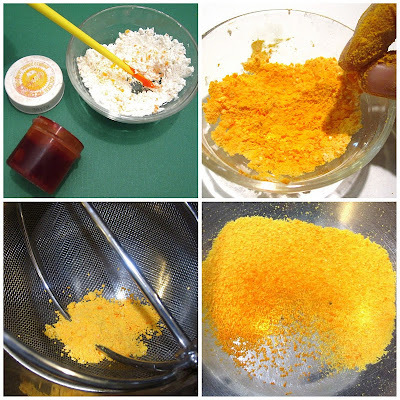 Using your fingers (wear gloves if you don't want it to temporarily stain your fingers) rub the powdered sugar and food coloring together, adding more coloring, until you have reached your desired shade. Once you have reached your desired color, sift the powdered sugar to remove any clumps, so it is back to its normal powdery consistency. For the pumpkin, flatten an orange fruit chew into a circular shape slightly larger than your pumpkin cookie cutter. Cut out a pumpkin shape and attach a green candy as the stem. The stickiness from the candy should be enough to adhere it to the chocolate bar, but you can always use some melted chocolate to stick it in place better. Applying medium pressure, use a toothpick to engrave a message, name or image on to the flat (bottom) side of the chocolate bar. Brush away any excess chocolate shavings. Get creative and have fun! Try different fonts, messages, or even engrave a fun drawing. Sprinkle your engraved chocolate bar with your colored powdered sugar. Using your finger, gently rub the powdered sugar around, so it falls into the lines you have engraved with your toothpick. Using a damp paper towel, wipe the surface of your chocolate bar to remove all excess powdered sugar, leaving your inscription filled with powdered sugar so it will stand out. Make sure your paper towel is not too wet, so it only removes the powdered sugar on top of the chocolate and does not erase the powdered sugar that has filled the crevasse of your inscription. 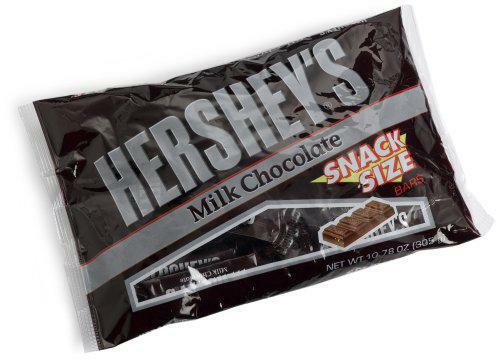 Melt chocolate chips according to package, and use it as a "glue" to attach festive candy around the border of your chocolate bar. You can package them up in clear plastic bags tied with ribbon for gift giving. If you want to make plaques that stand up, you will need half of a marshmallow (cut width wise) for the back of each bar. 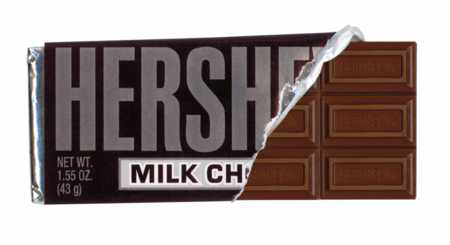 Using your melted chocolate, attach the cut side of the marshmallow to the bottom-center of your chocolate bar. Be sure to check out more Halloween Recipes & Treats here!